Welcome to the fourth and final part of our most recent series of blogs that has been delving in to the exciting world of online promotional videos. In Part 1 of the series, we looked at an example of a great promotional video from DollarShaveClub.com that went viral, and considered exactly what it was about it that caused so much stir across the internet. Then in Part 2, we considered the importance of targeting market segments, rather than trying to make something that is overly generic (and therefore lacking focus). Last week, Part 3 was our practical guide explaining exactly what equipment and software is needed to make a great promotional video, as well as how to edit and finish your piece to a professional standard. Finally in Part 4, we will now be focussing specifically on green screens, and the benefits and practicalities of their use. We hope you’ve enjoyed this series. The Weather Channel has been subliminally championing the benefits of going green for a long, long time. Though it’s not only warnings of climate change, global warming and holes in the ozone layer that should capture your attention – especially if you’re moving into the part-real/part-fantasy world of using green screens for your promotional videos. Our favourite reliable weatherman has been making use of the technique for a long while now, and in fact the green screening method has been around since the 1930s (albeit that the screen was blue at the time (and indeed a blue screen is still used by some filmmakers). As Michael Fish brilliantly demonstrates, green (or blue) screens are very clever tools for layering two video streams on top of one another. Weather forecasts simply would not be the same without them. In the foreground you have your expert explaining to the world exactly why there isn’t a hurricane on its way, and in the background there is a large CGI map full of diagrams, numbers and technical information backing up his assured claim. Indeed, with green screen technology, you can make anything and everything seem real – blow-up a full-grown woman so big that she walks through cities taller than skyscrapers; make her don a Wonder Woman costume and fly off through space like a superhero; make her strength appear so colossal that she flicks the planets in our galaxy around like marbles. The possibilities are endless (and this might make a good promo video for a perfume or a new car model – I mean, the concept seems obscure enough the fall in line with the others, right?). The secret to creating these stunning visual effects lies in something called chromakey. This is the movie making digital magic trickery that makes the layering of two video streams possible – and it starts with keying. 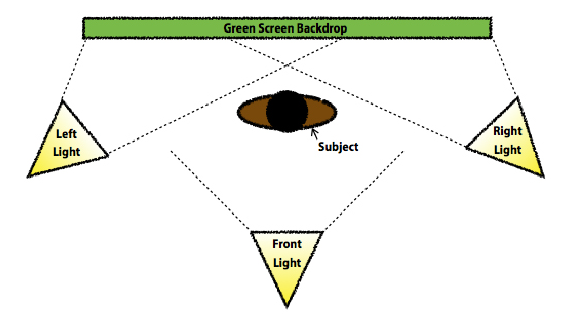 Keying is the technical term that refers to the process of isolating a single brightness value or colour (i.e. green) in a digital image, and then, through the use of special software, turning that colour transparent and digitally replacing the effected areas with another image. What’s So Special About Green? Well, nothing per se. It is in fact possible to key out any colour in the spectrum. But the reason why that rather ghastly bright green is most commonly used is largely down to contrast. You see, in order for chromakeying to work, the area that is set for isolation (i.e. the green screen background) must be a distinctly different colour to what’s being filmed in the foreground. Not a lot of actors will wear that green for their roles in promo videos (or weather forecasts for that matter), and so the distinction is made by the software. If the actor were to wear a bright green shirt that matches the background too closely, for instance, then his shirt would also key out, leaving just a talking head floating around alarmingly above a disembodied pair of jeans. Fortunately green screening technology is actually inexpensive, and, with just a few simple tools, you can start making your brilliant chromakeying promos practically anywhere. You can of course hire out or buy a special green screen that is built for purpose. But in fact, anything bright green will work. You could go and purchase a large piece of fabric from the fabric store, for instance, or use big sheets of green poster board, or even just find a suitable smooth wall and paint it green. The only thing that you need worry about is that the background be big enough to fill your screen. So, if you’re just going to be using miniature puppets then the background you will need will be much smaller than if you wanted to set up a 30-piece choir to sing the national anthem. This is the secret to success – you must light your set evenly and smoothly, removing all background shadows that are cast by the actor or any other object. 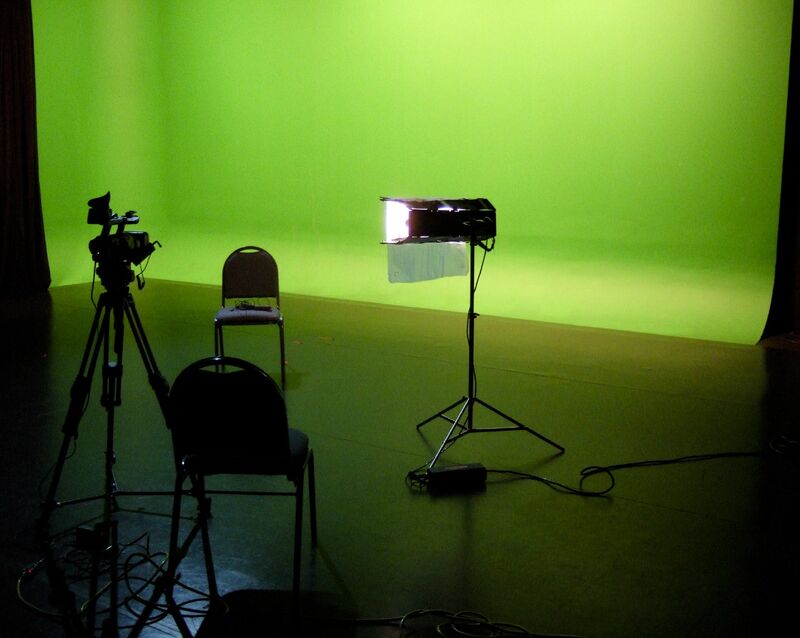 Put simply, if you are just starting out in the world of green screening and are trying to make a video on a tight budget, then you will save yourself a lot of money and frustration if you do not script in any motion from your actor. All 3 of these come with their own special features and functions, so do a little research before deciding which one is best for your purposes. This wraps up our Promotional Video Series. We hope it’s been of use to you, and welcome any questions or comments that you may have.